We realise that many of you reading through our website will be trying to understand whether our holidays are suited to your level of ability. This page aims to answer that question for you, and help you understand what our riding is like. We have include sections here aimed at “Experienced” and “Less Experienced” Riders – please read on and learn more about how we operate and you’ll discover that our holidays are more accessible than you might imagine, adn also how you can benefit from our mountain bike skills coaching. At Singletrack Safari we have designed our holidays to provide really satisfying and rewarding riding for a mixture of abilities, from the most technical of riders through to those who are continuing to develop their skills. We realise that this covers a broad range, so we will explain a little more about what you can expect and how to decide whether our holidays are suitable for you. We have years of experience of technical trail riding and we are happy to share it if you would like any support. The entire reason for Singletrack Safari’s existence is to allow riders to experience the absolute finest riding in Europe on a daily basis. Our routes and locations are labours of love which result from over 20 years of riding trails all around the continent – what we have created is the best mountain biking you can experience anywhere. We pride ourselves on our routes – they will challenge even the most experienced riders at times – but they are designed to be enjoyable by a broad variety of riders. Each ride will reward and excite different riders, for different reasons, at different times! Mid-ride we’ll make sure that you are well aware of any upcoming hazards or particularly tricky sections which you may need to be aware of – we won’t overdo the advice and spoil the flow of your ride, but there are definitely occasions where being forewarned of what is around the next corner helps you enjoy the day more! If you enjoy a technical challenge, rest assured, you will absolutely love our trails – we have created a selection of routes that can test even the most skilled riders at times. Some of our routes are more challenging than others – although none of our rides are technically “easy” throughout their entire length, some have fewer challenging sections and more “flow”. We generally aim to ramp up the difficulty level across the course of the week, as this helps any rider build their confidence and go home feeling that they have developed. So, what do we mean by “less experienced”? Firstly we should be clear; our holidays are not suitable for beginners. We’d recommend that our holidays tend to suit people who have been riding for at least a year or so, on a regular basis. You’ll be experienced in riding on singletrack trails, either natural or man-made, and you will be used to dealing with a few technical trail features. We’d describe riders of this level as “improvers” – you probably read the skills sections in magazines and are aware of the techniques you need for Mountain Biking – even if you haven’t entirely got to grips with them yet! Don’t worry – you don’t need to be an expert to ride our trails, but you will feel reasonably confident on your bike. As you will see below, we are equipped and able to help you develop whilst riding with us. Our trails are sometimes tricky, but we’ll give you all the support you need to develop. As we have already mentioned, our holidays aren’t suitable for beginners – as an extremely diverse level of ability within a group can genuinely cause problems. We’ve found that holidays which cater for both beginners and more skilled riders simultaneously tend to be very difficult to manage and are ultimately dissatisfying for everyone! With the level of riders Singletrack Safari is targeting there will still be a mixed ability element, but nothing significant! Some people are always going to be faster than others uphill or down descents, but it is amazing how most people ride at a similar pace over the length of a day. It’s a universally accepted norm that some people are faster on certain sections – it’s the nature of the sport. However, with the level of ability we are suggesting as a minimum the group will gel effectively and no-one will feel self-conscious or frustrated! We also pace the group carefully to ensure that you have a good time – this is a holiday after all! Please, don’t be concerned – there is not a huge gulf between “improvers” and the more experienced riders – it never causes a problem, and you can rest assured that the people that fly uphill will be glad of a rest at the top anyway! Meanwhile, those who are first to the bottom will be grinning insanely and excitedly jabbering about that switchback or rocky section which nearly caught them out…. Ultimately, even the very best of us have “off days” where we are struggling – and therefore no-one should ever feel ashamed to simply get off and walk a section if necessary! There’s one set of switchbacks in the Alps which we’ve only managed to clean once since 1995! In Andorra we use uplifts in high season on a dailu basis – even in low season we try to do this most days – the aim is to descend at least three times the height we gain – and on some days there is no climbing. At. All. However, a bit of fitness is going to be required, but we always use the lifts and vans to get extra height whever we possibly can! 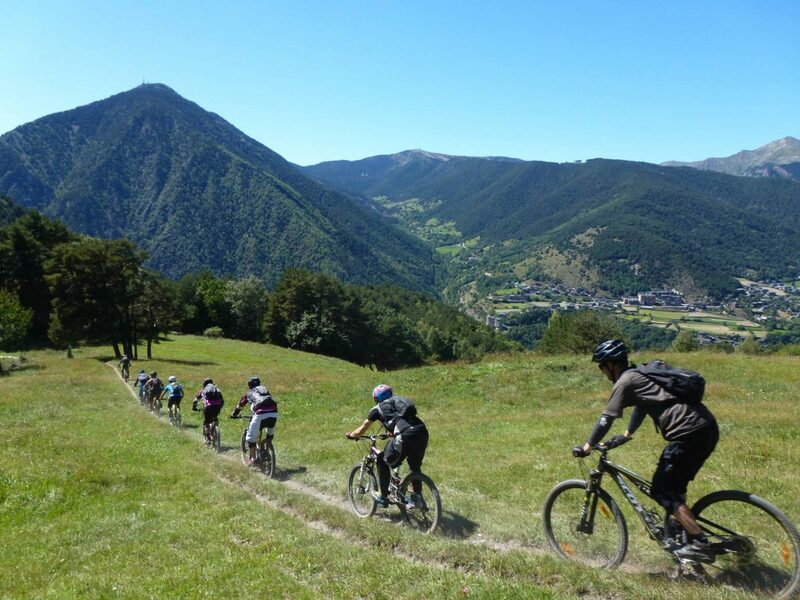 For our all-mountain/ enduro holidays you’ll need a reasonable level of fitness wherever you are riding – even in the Alps and Andorra you will need to ride uphill; we can’t use lifts every inch of the way as the perfect singletrack descet is not always going to be accesible by lifts of vehicles! The lift systems help us gain far, far more altitude than a normal day’s riding would allow you to achieve, but if you are on a guided holiday you are still going to have to pedal sometimes! If you have experience of regularly riding for at least 4 or 5 hours at a time you will be have no problems at all with fitness. Almost every day we will be very nice to you and drive to a high point to start a ride – and we will usually then ddo a point-to-point ride where we meet the van elsewhere later. Our Enduro holidays offer more flexibility to add in extra lift-assisted riding, but some of the finest descents will still require you to put in some effort to reach! If you are looking for a gravity-assisted holiday try our DH options – available in Andorra, you don’t have to be a full-on downhiller to enjoy a week of letting the lifts takes the strain! Riders who are purely going to be riding Downhill know that the stereotype of no fitness being required is untrue – you’ll definitely get the most out of your week with some strength and endurance to rely on. More fitness equals more runs per day, without feeling so tired, whilst making fewer errors….but at the end of the day DH is different things to different people, and you will know what level of fitness your riding requires! Our trails are carefully handpicked to ensure that most people can ride most sections, whilst other sections will challenge even the most skilled of riders. On a day-to-day basis, if there’s a section that you are finding tricky we are happy to offer free skills coaching and advice, whilst riding, in order to conquer things that you find tougher. As the European Holiday Partners of Cyclewise Training we are fully qualified guides, holiding either the British Cycling Mountain Bike Leaders (MBL), or an equivalent high-altitude guiding qualification. These qualifications include the coaching and support of riders. We’ve got a lot of experience between us and have ridden most disciplines too. Our qualifications and levels of experience make us particularly suited to tutoring intermediate riders who would like our advice and support, and we can help you understand and clear sections you might not have felt comfortable with previously. We’re also very happy to help you develop your riding skills more formally if you would like us to – whether this is simply for a day or over the course of a full week. We can even arrange a specific coaching week with professional rider Cedric Gracia for larger groups – please contact us for more information. You will be amazed how much your ability will develop across the course of a whole week of riding –by the end of the week you will be riding more confidently and smoothly than ever before. 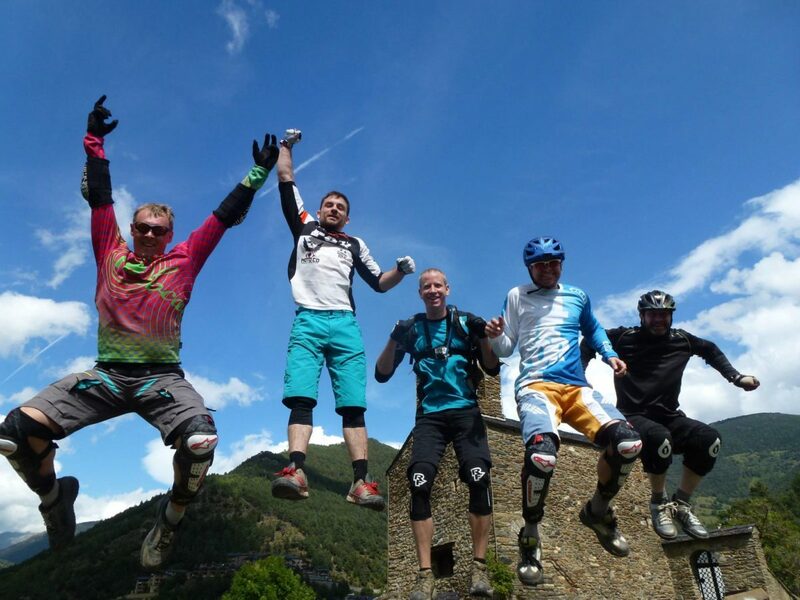 "...what mountain bikers dreams are made of...these guys provide the full package!"